On the First Sunday of Advent, we light our Advent Wreath candles and pray the Advent Wreath prayers before we say grace. We will keep the candles lit until dinner is over. The kids take turns each night blowing out the candles. We put our Advent Tree with our Advent books underneath it to read to the kids every day. We will not put lights on the tree until December 21st, the 5th day of the O Antiphons. I bought plastic purple ornaments to put on the tree whenever the kids do a Corporal work of Mercy. We will also set up an empty stable. We gradually add the figures throughout the 4 weeks of Advent. On the First Sunday of Advent, we set up the stable. Then on the Second Sunday of Advent, we add the animals. On the Third Sunday of Advent, we set up the sheperds to watch over their flocks. On the Fourth Sunday of Advent, we set up the empty manger. On the morning of the 24th, we put Mary and Joseph in the stable. On Christmas morning, we place Baby Jesus in the manger. Finally, on Christmas Day we start moving the three wise men towards the stable. Each day they get closer, arriving on the feast of the Epiphany. Acts of sacrifice, prayers for the poor souls, the Rosary and other Marian prayers, doing extra chores without being asked, going to Mass. The Jesse Tree is another wonderful way to celebrate Advent. A Jesse Tree is a small. leafless tree decorated with symbols portraying Jesus' spiritual heritage. It is a kind of family tree, which suggested by Isaiah's prophesy, " There shall come forth a shoot from the stump of Jesse and a branch shall grow out of his roots." Lastly, you can make an "O Antiphon House". December 17 marks the beginning of the "O" Antiphons, the seven jewels of our liturgy, dating back to the fourth century, one for each day until Christmas Eve. These antiphons address Christ with seven magnificent Messianic titles, based on the Old Testament prophecies and types of Christ. The Church recalls the variety of the ills of man before the coming of the Redeemer. The "O" Antiphons are the verses for the ancient hymn O Come, O Come Emmanuel. The first letter of the Messianic titles: Emmanuel, Rex, Oriens, Clavis, Radix, Adonai, Sapientia—spell out Latin words ERO CRAS, meaning, "Tomorrow, I will come." This prayer is often called the "Christmas Novena" because it is prayed from the Feast of Saint Andrew the Apostle (November 30) until Christmas. The first Sunday of Advent is the Sunday closest to the Feast of Saint Andrew. You can say the prayer all 15 times, all at once; or divide up the recitation as necessary (perhaps five times at each meal). This novena is posted on the left side of my sidebar. After many hours of shopping online using my wonderful, beautiful, thoughtful daughter's laptop which I stole while she was at work ;-) I am finally finished with our Christmas shopping. My goal is always to finish Christmas shopping before Advent begins. This always takes me such a long time to do, because not only do I shop for our kids from us, I also pick out presents for the kids from my parents and my in-laws. It's great that they let us choose what to get for the kids. My mom and my mother-in-law always give us money to buy gifts for the kids, which is great because I get to pick out what the kids get, but I have a hard time picking things that are going to last and be educational. We give each of our kids 2 gifts, and then I choose 1 more present per child from each set of grandparents. Times that by 4 gifts X 7 children and that's a lot of stuff to choose from. Thank goodness for the internet. I don't like shopping at all. I love to see the big brown truck pulling up on our driveway. We truly are so very blessed! Saturday afternoon I continued organizing the kitchen cabinets. The only ones left to organize are the cabinets with our dishes, the coffee and tea cabinet and the bills cabinet right above the computer desk. That one is going to take me a few hours to do, so I'm leaving that for another time. It's very overwhelming right now. I need to get a few folders and label them before I start with 3 years worth of paperwork. Here is what I did this weekend. This is where I keep the cookbooks. I only kept 2 La Leche League cookbooks, a Rachel Ray cookbook which my kids gave me 2 years ago for my birthday and an Emeril cookbook which Bernie gave me for Christmas. I'm going to donate the 2 cookbooks on the right to our local thrift store. I couldn't bear to throw those away. This is our spices cabinet. I don't have enough items to put on the top shelf. It's a good thing, since I'm so short. There's not much left to stoe above the microwave oven- just a lonely little serving bowl. This is our medicine cabinet. This is where I really threw a lot of stuff away. We had way too many old vitamin bottles. This was probably the biggest improvement in the kitchen. Oh, I still have not organized the cabinet where I keep the glasses and plates and also under the kitchen sink, which is where I keep all my stone baking sheets and serving platters. I also store the kitchen linens under there. I hope to finish this weekend. The Legend of the Poinsettia December 19th, the 3rd O Antiphon "Radix Jesse"
And here are more wonderful books to be enjoyed this Advent. Today is a very special feast day in our family. St Catherine of Alexandria, one of the "Fourteen Holy Helpers," is the patron saint of many things, most importantly educators, schoolchildren, students, teachers and apologists. We have been formally homeschooling for 12 years, although we as parents start educating our children from birth. I will be invoking the help of this most powerful saint, especially during the most difficult days of homeschooling. Glorious St. Catherine, virgin and martyr, help me to imitate your love of purity. Give me strength and courage in fighting off the temptations of the world and evil desires. Help me to love God with my whole heart and serve Him faithfully. Here is a great idea for dinner tonight. Cook pasta for 6 minutes; drain and drizzle with 2 tablespoons extra virgin olive oil and spread on a cookie sheet to cool. Boil green peas in salted water for five minutes, drain and cool. In a skillet over medium heat; cook chicken in remaining olive oil for 4 to 5 minutes or until cooked through, season with salt and pepper. Allow to cool. Cook bacon until crispy, drain fat. Combine all ingredients, let sit 30 minutes before serving. Recipe provided courtesy of Barilla. 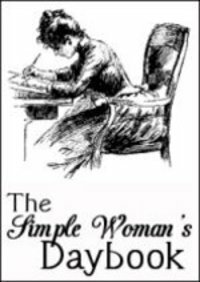 Stop by Peggy's to see today's Simple Woman's Daybook posts. Outside my window…beautiful blue skies, but very cold this morning. I am thankful for….our beautiful children. We are so blessed to have a baby in the house again. From the kitchen…braided egg bread. I was going to make cornbread for dinner last night, but Marygrace saw a recipe for the egg bread and wanted me to make that instead. I'm very glad we did! I am creating…a more organized home. I am going…to Lowe's to get more suplies for the basement. Not much longer until the drywall goes up. I am wearing…flannel Eyore pajamas. I usually get dressed around 6:30 in the morning, but I decided to stay in my pajamas until after breakfast. I am hoping…to finish organizing the kitchen today. All I have to do today is the spice cabinet and under the kitchen sink. I am hearing…my boys doing a play with my Southern Living at Home set of Three Wisemen. They are so funny. They like to take my digital camera and record themselves doing crazy things. Around the house…a very pretty little girl walking around the house. She's getting so big and she's very fast. One of my favorite things…taking a nap with the baby. She's down to one nap a day and I am hoping to take advantage of it. Cuddling a baby is the best thing in the world. Here is a picture thought I am sharing with you… Cecilia was confirmed last Sunday. My husband took the picture and Adrianna was outside when it was our turn for pictures.